“Celebrate Water” is the theme of galleries, theaters, schools, and music all over Door County this year. The idea came to my friend Anne Egan when her son, Dan Egan, wrote his acclaimed book “The Life and Death of the Great Lakes”. She has spearheaded this idea, and through the Community Foundation of Door County, brought it to fruition. 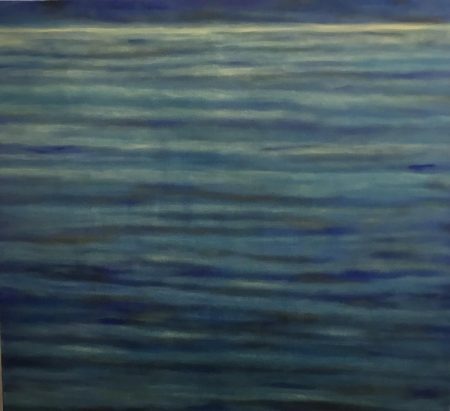 Like many artists in Door County, I spent last winter painting all about water. 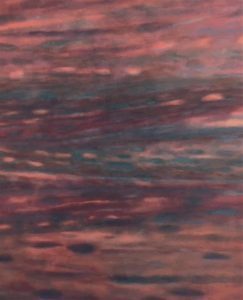 Like water itself, the paintings are full of a myriad of colors, patterns, flecks of light, and movement. Sometimes there are horizon lines where water meets sky, other times there are no horizons, only the implied waves and currents with spots of color forming patterns of light touching the water’s surface. 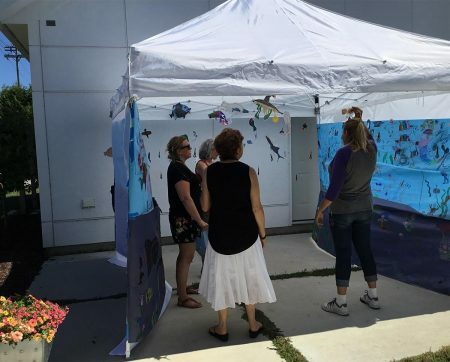 The Boys and Girls Club under Nicole Chapeny’s direction, created an underwater installation in a 10’X10’ canopy which I was pleased to display here on our own patio at the gallery. Past Door County poet laureate, Estella Lauder, shared her exquisite poem “The Color of Water” with me. In words she expresses what I try to express with paint, the mercurial nature of water. slate blue away from shore? Previous Isadoora Theatre Company – Proof by David Auburn playing at our Inside/Out Space	Next How is Fall Different?